I have learned recently just how much my tastes have changed over time. When I first started watching this Craftsy class, Traditional Blocks Made Easy, a million years ago, I sincerely got bored out of my mind and walked away from it. I brought out the first project last week, cleaned off the dust and set back into the grove of learning new techniques! 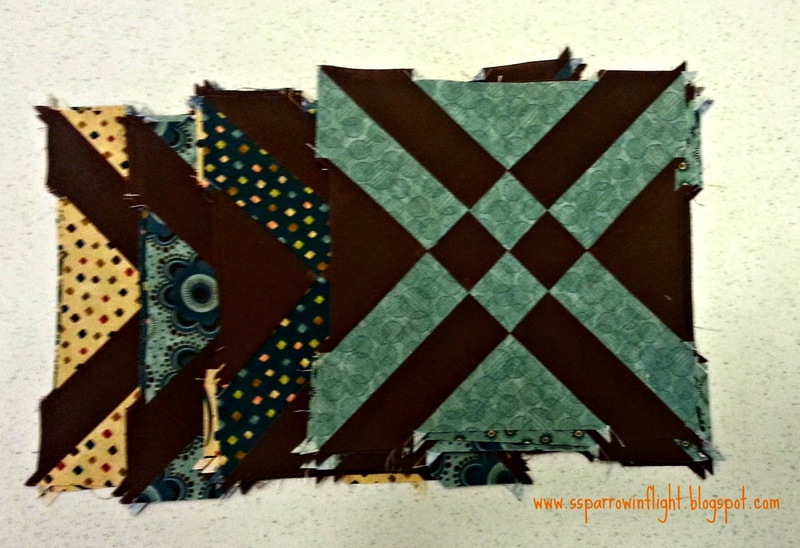 I currently have 20 blocks completed for the "Anita's Arrowheads" segment. They are measuring about 9" so I am thinking that I need to make some more if this is going to be a lap quilt for a guy. I am planning on adding in mote of the beige and a pile of olivey greens. I am actually really enjoying myself now that I gave the class a real chance! That will make a great finish. I love the colors. I made this quilt in Christmas fabrics for my daughter..love how it came out! made the blocks and putting them together without boarders, and have difficulties with matching seams because of the bias edges.